1. Money can’t by happiness, but it can make misery a lot more comfortable. 2, Forgive your enemies, but remember the bastards’ names. 3. Help someone when they’re in trouble and they’ll remember you … next time they’re in trouble. 4. Many people are alive today only because it’s illegal to shoot them. 5. 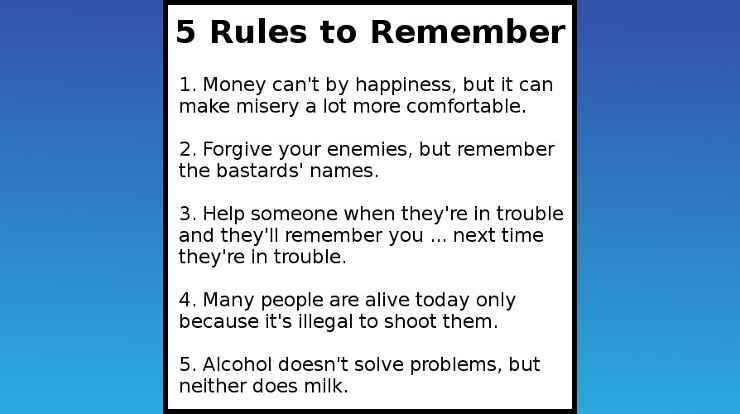 Alcohol doesn’t solve problems, but neither does milk.